If you're going to be taking a lot of showers and spending a lot of time in your apartment, it should be apparent - nay obvious - by now that you need a robe. 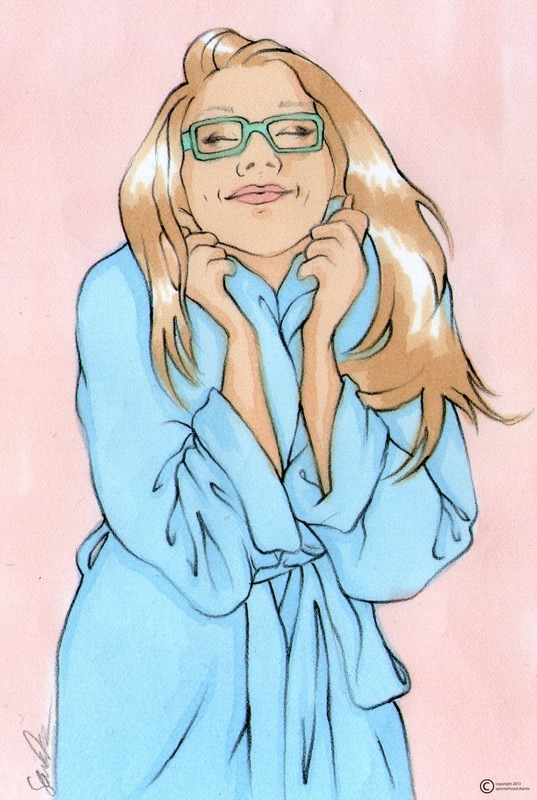 I like to go with a good robe-over-pajamas combination finished off with a good thick pair of socks in the winter. However, I'll leave the details of your loungewear ensemble to you. The most important part is that you have a robe. 1. Seasonal Appropriateness: You'll want different robes for different weather. Your summer robe should be a lightweight terry or waffle fabric, preferably with short sleeves and at least a knee-length hem. I've been looking for years for a robe with short sleeves but a long hemline, but alas the only ones I can find are clearly made for grandmothers. I am particular about robe length as I like to sit on the floor to apply my makeup. Your winter robe should be a heavier fabric such as a chenille knit or a terry cloth. I would not suggest fleece, though it is tempting, as fleece tends not to be very absorbent, and when you are washing your face or getting out of the shower, this is of the utmost importance. 2. Robe Construction: My friend Virginia's mother prefers a zip-front robe, and I must say I have yet to try this option. For now, I prefer a classic belted robe with two generous patch pockets in front. This way, you can put your glasses in your pocket while you wash your face and not have to search frantically for them once you are finished. The belting is just a more secure feeling to me. 3. Size: Normally wear a small? Go up a size. You want to make sure you have plenty of cozy robe for your lounging bliss. 4. To be fancy or not to be fancy? : Currently, I don't own a silky robe or matching loungewear-and-robe set, but I think they're cute. I will say, though, I don't think they're as functional (re: absorbent) as a classic robe and therefore serve an altogether different purpose. However, I think I may invest in such a set soon just for my own personal satisfaction. 5. When to wear it: Pretty much all the time. As soon as you get inside your front door, take off those pants (as I've said before), and get into your pj's and robe. You know it's better than what you were wearing all day. And you also know you're not leaving your apartment again now that you're there. So robe up. In conclusion, if you don't already have a robe, get one, stat.